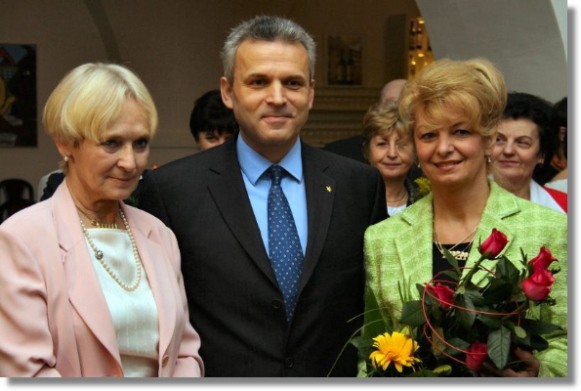 On March 2, 2006 a meeting of Centipede children and teachers with the president of the movement Mrs. Bela Gran Jensen took place at 2nd elementary school in Litomysl. At 10 o’clock, the children welcomed special guests with Mrs. Bela in the gym of the school, handing over flowers beautiful pictures and singing songs. After this, Mrs. Bela greeted children and thanked them for their wonderful work for Centipede. Then she introduced warrant officer Lubomír Volný who was telling about his experiences in the peace forces in Kosovo and Iraq – about the importance of the Centipede help in this regions and how the cooperation with Centipede changed his life. Mrs. Bela continued with her story about her last visit to Basra, Iraq (in July 2005) when a British high ranking officer told her, after presenting the gifts: „... I have been here for 8 moths already, but today for the first time, I saw happiness. “She also conveyed the greetings to children from other co-workers of Centipede – Hana Flanderova, consul of the Czech Embassy in Thailand, and major Karel Kout, who is now on a mission in Congo, Africa. Following this, Mrs. Bìla introduced to children the representative of the Order of St. Lazarus of Jerusalem – Mr. Petr Rehor. He explained to the children the role of the Order and was talking about its history and present time. He stressed out that the Order considers the cooperation with the movement „On Own Feet” very important. Then, Lt. Col. Petr Milcicky was remembering about his first meeting with Mrs. Bela, while handing over the ambulance car in Pristina, Kosovo. The director of the psychiatric hospital for children, Dr. Iva Hodkova was talking about the heartaches of small children and help that the hospital, together with the Centipede, brings to them. Her speech impressed everybody very much. The children were waiting impatiently until 11 o’clock, when long awaited guest appeared – Minister of Defence Mr. Karel Kühnl. Everybody welcomed him with the Centipede anthem „Never be alone“. At the beginning of his speech, Minister told that he was a bit embarrassed, as since last 20 years he did not see so many children together; nevertheless, he can be sure now, that the Czech nation will not die out. He praised the beautiful city and it sights: „You live in a beautiful city, school, but not everybody is as happy as you are...“ He highly appreciated the devoted work of the children that helps other children: „A man is not here only to look after himself, but to help to those who need it and to get help from the others...“ He pointed out the cooperation of the movement with the Army of the Czech Republic hoped the work to be known to wide public. Mrs. Bela thanked to the Minister for his words and assured him how proud she was that the movement could cooperate with the Czech Army. She also appreciated the work of the children and teachers of the 2nd elementary school in Litomyšl. After that, the Minister was asked many many questions: Where in the world are our soldiers deployed, how do you like our school... The children were also asking about the feelings of the soldiers in the missions. Minister stressed out that he himself is not a soldier; however he explained how the soldiers feel. He also explained how the military hospitals work and help. Some questions were very private, but he – after a short hesitation – shared his small little secrets. The children were impressed a lot by the friendly behaviour and bright answers of the prominent guest; no wonder that the Minister, Mrs. Bìla and Lt.Col. Milèický had to „fight“the crowd of children who wanted their autographs. The visit in Litomysl was not over, though. The guests moved to the Castle brewery where they met the best Centipede teachers from the whole republic. After the opening speech, when the Minister thanked to everybody, every single teacher was introduced to him by Mrs. Bela and told about his/her assets for Centipede. During the tour of the castle cellars they could see the exhibition of the sculptor Olbram Zoubek, followed by the visit of the birth house of Bedrich Smetana. The visit of the Minister was slowly coming to its end. Mrs. Bela asked him to accept the patronage over the movement. Minister Kühnl agreed. Then he had to say good bye. He thanked once again to everybody for their wonderful work. Nevertheless, the program was still not over. Mrs. Bela talked to the guests, reminded the events and projects of Centipede in the regions of the Czech Army deployment. The representative of the Order of St. Lazarus of Jerusalem – Mr. Øehoø – stressed out in his speech the importance of the work of Centipede and indicated other possibilities of its cooperation with the Order. The director of the psychiatric hospital for children Dr. Hodkova tried to explain some of the problems of the small patients in the hospital. Her speech attached everybody’s attention and it was clear that not everybody can imagine the tough fate of these children. The time was passing very quickly and the participants of the meeting had to say good bye, as there was a long way ahead of them. Allow us to thank to all the organizers of the meeting – the director of the school, Mr. Daniel Janata, the mayor of the city Mr. Jan Janecek, the director of Smetana´s Litomysl Mr. Jan Pikna and mainly the teachers – Mgr. Ludmila Drobna and Mgr. Eva Rychtarikova – for the perfect preparation of the very special day.